Providing you the best range of cotton salwar kameez, anarkali salwar kameez for party, awesome bollywood salwar suit and printed dupatta salwar kameez with effective & timely delivery. We are the Leading Trader,Supplier and Wholesaler forCotton Salwar Kameez in Chennai,Tamilnadu,India. With our vast experience in this domain, we are engaged in manufacturing and supplying a wide range of Anarkali Salwar Kameez for Party. 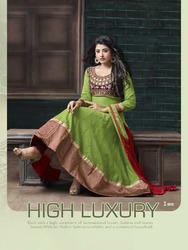 These salwar kameez are designed by our experienced professionals using high quality fabric and latest technology. Moreover, our clients can avail these salwar kameez from us at market leading prices. We are the Leading Trader,Supplier and Wholesaler for Awesome Bollywood Salwar Suit in Chennai,Tamilnadu,India. We are the Leading Supplier,Trader,Exporter and Wholesaler of Printed Dupatta Salwar Kameez in Chennai,Tamilnadu,India. Looking for Anarkali Salwar Kameez for Party ?